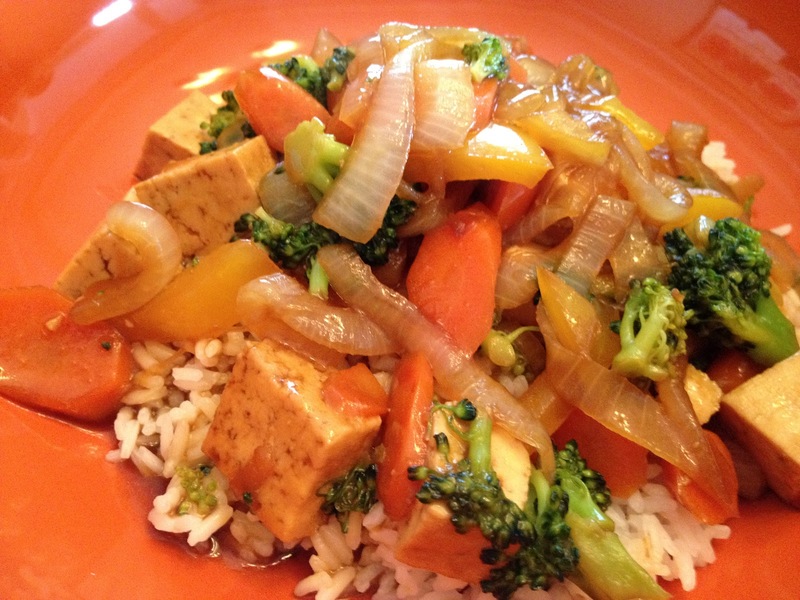 I adapted this recipe for teriyaki sauce from Dreena Burton’s “Eat, Drink and Be Vegan.” It is really quick and tasty. Press the tofu. Get the rice going. Slice the onions into half moons. In a pan with sides, heat up sunflower oil and saute the onions. Slice the carrots on the bias and add to the onions. Slice the peppers and add into the pan. Chop the broccoli, add to the pan with 1/2 cup water. Cover and let the broccoli steam. Pour in half of the teriyaki sauce, reduce the heat, and cover allowing the vegetables to cook in the sauce. Cube the tofu and pour half of the teriyaki sauce over it, tossing to coat all sides. Cook the tofu in a non-stick skillet over high heat until the sauce starts to boil. Lower the heat and add the vegetables into the tofu. Combine well. Serve over rice and enjoy!